Using a tennis backboard is one of the best possible ways to practice your tennis game in my opinion! When I first learned how to play Tennis, I used to hit the ball against a wall in my parents garage every day for at least an hour and it helped my tennis game tremendously. A proper backboard is actually not even necessary though to work on your game. All you really need is a wall and a surface where the ball gets a decent bounce! In order to get really good at Tennis there is no way around hitting thousands of balls even if you have great technique. The backboard is great for developing essential tennis skills! In Tennis you need to learn to judge the speed and spin of the incoming ball and coordinate your tennis strokes accordingly. Hand-eye coordination and anticipation are essential tennis skills and hitting against a backboard is great for improving these skills! The backboard is great for working on your technique. The balls come back in a predictable way, which is very important when working on your technique. A simple way to start, if you want to work on your forehand for example, would be to simply drop-hit the ball out of your hand, catch it once it comes back and do that over and over again. Once you get better you start hitting without catching the ball in-between but with a very slow pace. Finally once you have improved your stroke enough you can hit at a fast pace and even vary between forehands and backhands. You can essentially use the same progressive system that I use when working on technique with my students! Most backboards have a line that is supposed to simulate the net. You can use this line really well to work on your consistency. Simply set yourself some goals like hitting 30 shots in a row over the net without having to stop. As you get better you simply increase the number. 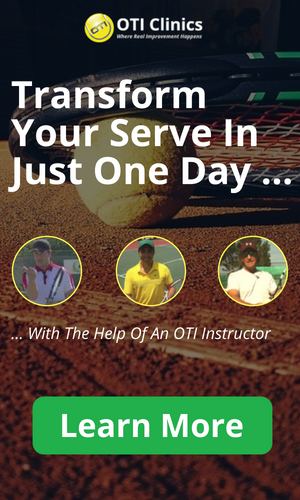 This can be a great way to develop consistency for your Tennis game! A great way to use the backboard is to create some targets on the wall and practice hitting them over and over again. Some backboards will already have targets on them or otherwise you can be creative and either draw some targets on there or just imagine your targets. Make the targets smaller or bigger depending on your level of play and start trying to hit them over and over. 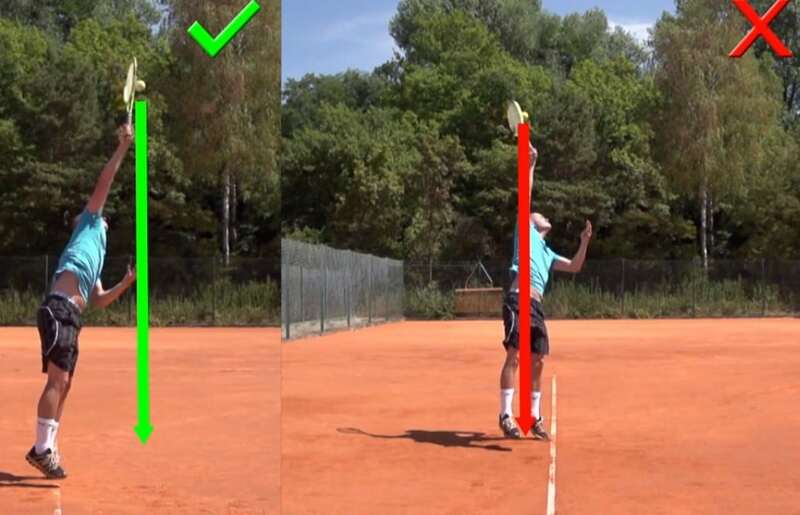 The great thing is that you can do this for every stroke including the serve. You could practice a single stroke that way or a series of different strokes. Using the backboard can be great for your footwork as well as your endurance. When hitting against a backboard the balls will usually come back really fast and therefore you do not have a whole lot of time for your next shot. This forces you to keep your feet moving and get in position quickly; exactly what you need to improve your footwork! Hitting against the backboard can be quite exhausting. The backboard never needs a break and the ball always comes back instantly. When you practice with a partner there are always plenty of breaks in-between because the rally is over and you or your partner take your time before starting the next rally. Therefore the backboard can be a great way to improve your endurance for Tennis. Simply continue hitting for a few minutes at a time and you will soon find out what I mean! Once you have a certain amount of endurance in Tennis, other physical aspects become much more important. Once you reach a certain level in tennis, points are usually very short but often have a high intensity. The maximum rest period between points in Tennis is 20 seconds. Therefore it makes a lot of sense to work on your tennis conditioning in a similar way! At the backboard I recommend simulating a tough rally where you hit anywhere from 5 to 20 shots. The important thing is that you push yourself hard during these shots and practice with a high intensity. Now you rest for 20 seconds and then you do this over and over again. I often call this Interval Tennis and it is in my opinion the most effective way to work on your tennis conditioning! On the backboard you can play a lot of great games against yourself. One example would be to set a goal for yourself like this: Hit a serve over the net-line and then another 3 shots in a row over the net line without missing/having to stop the rally. If you succeed then you give yourself a point and the score is 15-0. If you don’t then the score would be 0-15. Now you can play out entire sets like this and really challenge yourself! So that was it for tennis backboard practice. Now is the time to go out, find a wall, and start practicing!